I have Raspberry Pi 3 with 3 DVB-T tuners. Today I connected 10 receiving devices (computers and smartphones) to it and CPU usage was still low. Even watching 15 HD channels is not a problem for Raspberry Pi 3. It seems that the 100 Mb/s Ethernet port is the only limit. See the attached pictures for details. However, Raspberry Pi 1 is not able to have more than 2-3 HD subscriptions, so please use Raspberry Pi 3 not Raspberry Pi 1. Use IPTRAF to see network traffic statistics. I attached IPTraf statistics for one SD (not HD) transmission to Kodi. I was connected to Raspberry Pi by Remote Desktop so it is also included in statistics. Why did you write that "packets per seconds" kills CPU? What is wrong? I noticed that you had statistics in kbytes/sec not in kbits/sec, so I changed mine to kbytes/sec in iptraf configuration. I made the same test for two HD transmissions to Kodi. something with is painful for performance. If MTU is so important, then maybe Odroid XU4Q ? On Odroid XU4Q the MTU can be increased to 6975  and it costs only $46. I can connect 4 DVB-T tuners to one USB 3.0 port via a USB hub like this: http://www.vakomtek.com/EN-H213/products/59/tc-242uk.html and then I can insert the whole into the enclosure as shown in the picture in the first post. Odroid XU4Q has Ethernet and power ports on the opposite side than USB 3.0 ports. So, I will not need to use cables to connect Ethernet and power ports to the enclosure. In addition, there will be access to the micro SD and HDMI port from the outside of the enclosure in case of any problems. Does anyone have a better idea for a low powered, small, quiet and cheap computer with several DVB-T tuners enclosed in one casing and able to serve about 10-20 clients? MTU is totally different thing it is for packages over 1480 bites and fragmentation. 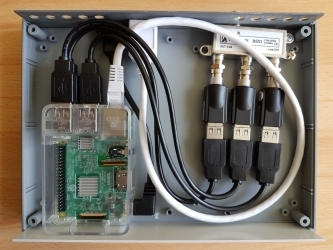 Your problem is packets per second "pps"
Very interesting, I've just spent a couple of days trying to get a August USB DVB-T210v2 device working with my Pi 3 and it was a complete disaster. What USB devices are you using out of interest. Are you using Raspian, which version of the kernel are you using. Also whats device are you using to split the signal 3 ways. I finally manage to get my Pi working with the Raspberry DVB hat and its working really well. Straight out of the box without having to install any media driver/modules, which saved a lot of time. Looks good, thanks for sharing. Small note, I would switch to the main repo, more info here now.